I want to start by saying this game is not Azul, it is not Sagrada. It shares a mechanic with Azul and a theme with Sagrada but is unlike either! Next Move Games have again produced a beautiful looking game with great components. 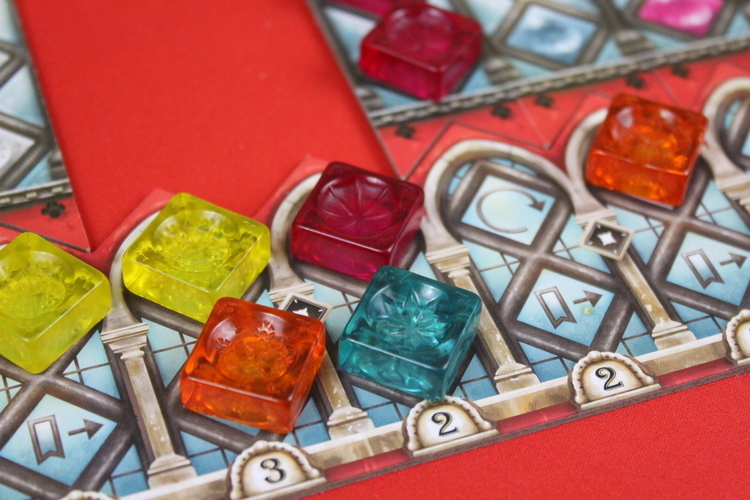 Azul was a surprise hit for us last year, will Stained Glass of Sintra be the same? Place the factory displays in the centre of the table, within everyone's reach. Use 5 in a 2 player game, 7 for a 3 player and all 9 for a 4 player game. Each player takes the player board of their colour and everyone places it the same side up - side A or B, each side has slightly different end game scoring. 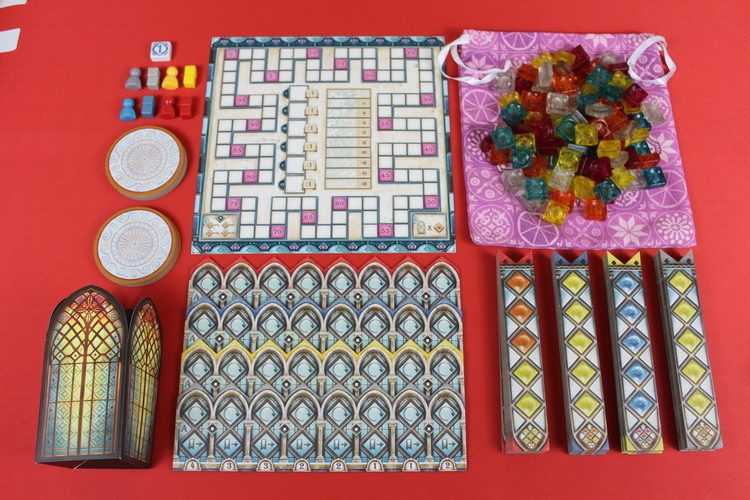 Take the matching coloured pattern strips and shuffle them up and place them above the spires on their player board. Each player has one strip that has two grey joker spaces on, if this is showing, flip the strip over. Place your glazier token at the top of the left most strip. Place one of your player markers at the top of the broken glass track and one at zero on the score track. Take one glass pane of each colour and randomly place them on spaces 2-6 on the round indicator. Put the rest of the panes in the bag and randomly draw one, place this on round one. Then randomly draw and place four panes on each of the factory displays. You are now ready to play. 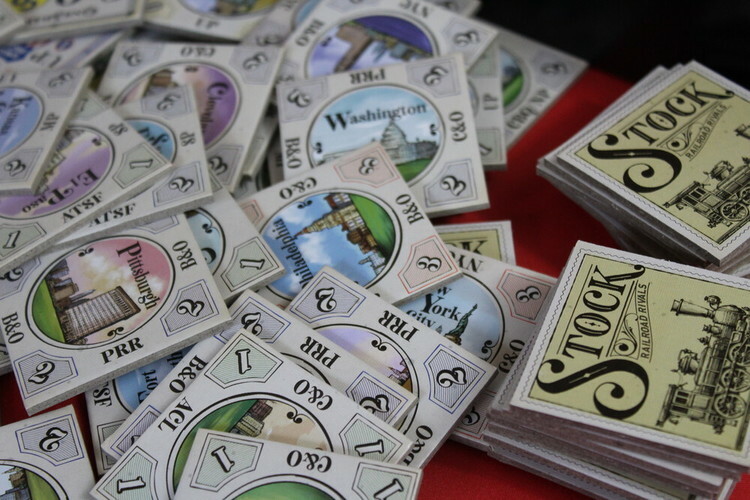 The game is played over six rounds with a final scoring phase, the player with the most points wins. 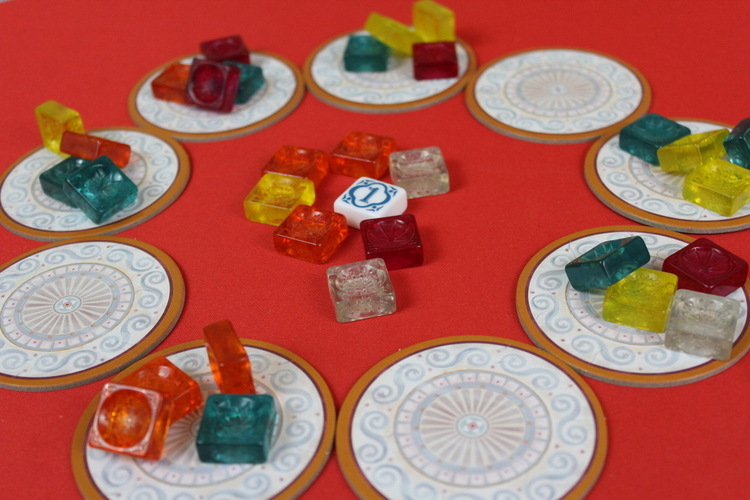 The first player starts by placing the start player token in the centre, then taking their turn. Advance a pattern - Pick all pane pieces from either a factory tile or the centre of the table. When taking from a factory tile, pick all panes of one colour and move the rest into the centre of the display. If taking panes from the centre, again, take all pieces of the same colour. If you are the first player this round to take from the centre, also take the start player token and move your marker down one space on the broken glass track. (this will be negative points at the end of the game) Then place the pane pieces on one of your pattern strips. The pieces you picked must go onto spaces of the same pattern strip and they cannot go on a strip to the left of where your glazier is. If you do not have enough matching spaces on your chosen strip, any excess pieces are considered ‘broken glass’. For each of these pieces, move your marker one space down the broken glass track and place the ‘broken’ pieces into the glass tower. Then move your glazier to the strip you have just placed onto. Then check to see if your pattern strip is complete. If it is, you get to score some points! First check against the round indicator, if any pieces match the top piece, gain one point for each that does. Next, remove all pieces from the strip, choose one to keep and drop the others into the glass tower. Then, place the pane piece you kept into the palace window below the strip you just completed. If that window is empty, place the piece into the top frame space and flip the pattern strip. If the top frame already has a pane piece in it, place it into the bottom frame space and remove the pattern strip above it and return it to the box. Then score the window - gain the points printed below it and all points printed below frames to the right that have pane pieces in. Move your Glazier to the leftmost pattern strip - Instead of picking any pieces, you may move your glazier to the leftmost strip in your tableau. Note, you cannot choose this action if your glazier is already in this spot! The round ends when there are no more pane pieces left to pick. Remove the top pane piece of the round indicator and place it in the glass tower. Refill the factory displays with four pieces each from the bag. If at any point, the bag is empty, refill it with the pieces from the glass tower and continue filling the displays. After the sixth round, the game ends and final scoring takes place. Gain one point for every three pieces left on your pattern strips. Lose points according to your position on the broken glass track. Then gain bonus points depending on what side of the Palace Board was used. Side A - There are four ornaments on your board. Count how many frames around each ornament contain a pane piece. If all four spaces contain a piece, gain ten points. For three gain six points, two gain three points and for one or none gain no extra bonus points. Side B - Count how many completed windows you have on your palace board (ie. both frames hold a pane piece) Choose one colour and count how many panes of that colour you have on your palace board. Multiply the numbers and score that many points. The player with the most points wins, in the case of a tie the player lowest on the broken glass track wins. Last year's Azul was a surprise for us. While the gameplay was pretty simple, the strategy ensured it got a lot of play from us, despite being lighter than my usual taste. 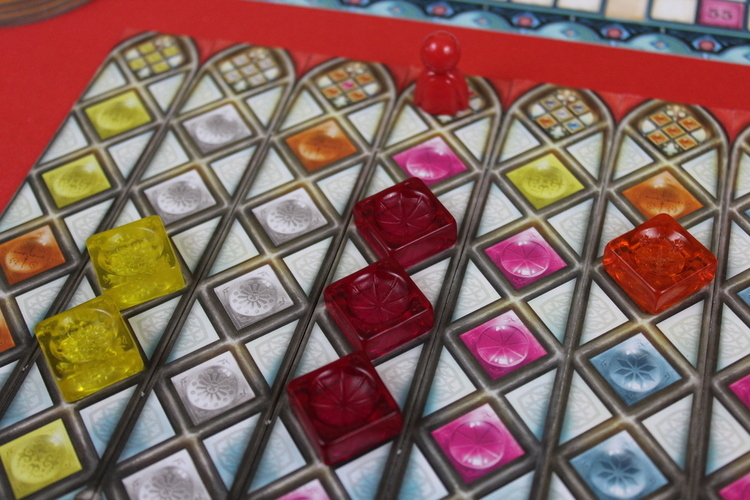 Stained Glass of Sintra takes the basic mechanism of Azul (taking tiles of one colour) and adds a lot more ‘game’ to it. I know a lot of people loved the simplicity of Azul, but this has more teeth for sure and would make a great follow up. This is more of a ‘gamer's game’ to me. 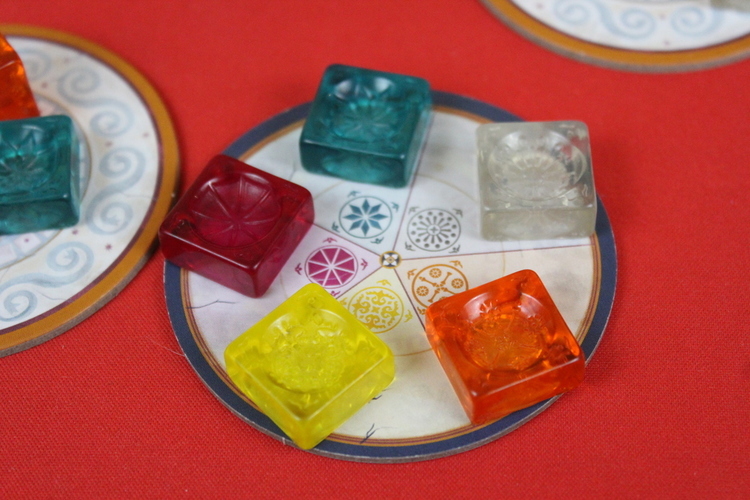 The crystal pieces have a glass-like look and feel to them and while the patterns are very pretty, they are also there to make the game more accessible to colour blind people, along with a variation on the factory displays. My one criticism of Azul was the horrid cardboard start player token (which has now been replaced) and this time, that has been done right, meaning the components are great quality. However, I am concerned about how the glass tower will hold up to multiple plays as it is quite flimsy cardboard - time will tell! Whilst Azul will come out for nights with non gamers, Azul Stained Glass of Sintra has now become a more meaty option for gaming nights. There is definitely room for both Azul games on any gamer's shelf.